A survey of recreational boat owners who make Hampton their home port concludes that these boaters bring $55 million to the city and help create nearly 700 full-time jobs. The study, conducted by Tom Murray and James Kirkley of the Virginia Institute of Marine Science and Doug Lipton of the University of Maryland, was commissioned by the city of Hampton. 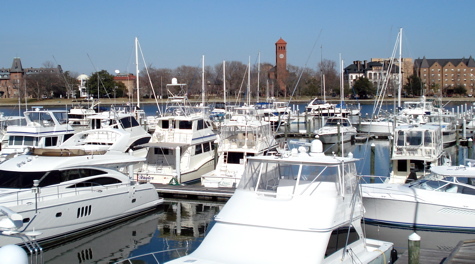 The authors surveyed both Hampton residents and non-residents who keep boats in the city to determine the economic impact of their boating-related activities. The city plans to use the study as it considers whether to change its tax policies towards recreational boats. In 2002, the boat tax in Hampton was reduced from $1 per every $100 of assessed value to $0.000001, and boat taxes have not been collected by the city since then. The City Council will meet in mid-March to vote on whether to reinstate the boat tax. The city gains $2.29 million in additional tax revenues from spending by recreational boaters, $1.31 million of which are derived from non-resident boaters. The full report on the study can be downloaded at http://web.vims.edu/adv/econ/analyses.html.